I was introduced by Coffee House Press to poet Sarah Fox just this spring, and she introduced me to her collaborator, Fred Schmalz the day of the recording. 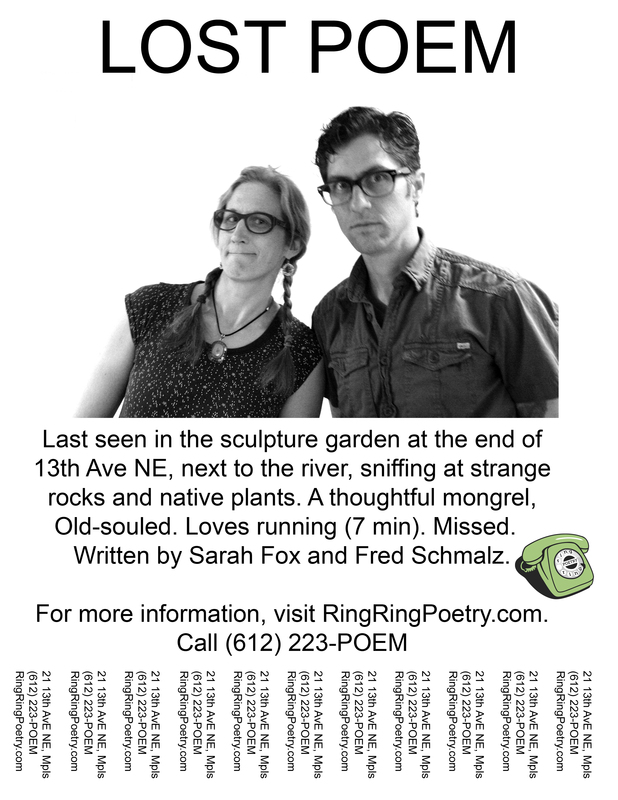 Their poem is the longest of the Ring Ring Poems, at 7 minutes, but fully embraces the idea of exploring a physical location with poetry. If you take the time to visit the sculpture garden, you’ll see the shapes and plants referred to in the poem, and perhaps learn a bit about them in the process. Thick with mythology and playful with sound, the piece is by turns light, philosophical, suggestive, and matter-of-fact. Performed back and forth between Sarah and Fred’s voices, it is perhaps the least “narrative” of the pieces thus far- suggesting shapes on a page like sculptures, the asking of questions about the nature of art and existence, and thoughtful explorations of what might be their answers.